Elyse Peters was the recipient of a fellowship with the Environmental Protection Agency. As part of her fellowship, she traveled to Bolivia, where she learned about legislation that gives ecosystems the same rights as humans. Elyse Peters, who is the fourth generation in her family to attend The University of Alabama, started her higher-education journey intent on pursuing a degree in chemical engineering. But a perfect storm of changes, including a $44,000 Greater Research Opportunities (GRO) fellowship from the Environmental Protection Agency (EPA), led her down an entirely different path. Peters was one of 40 recipients nationwide to receive the prestigious EPA fellowship and the first student from The University of Alabama to receive one since 2003. Many of Peters’s family members have worked in the oil and gas industry, so engineering seemed a natural choice for her. Bolstered by an interest in alternative energy research, Peters began coursework to become an engineer. As many students discover, college is a place to make choices. Peters, who, according to her family, always “marched to the beat of her own drum,” found that she wanted to work more closely with people. A professor advised her to switch to New College, which would prove to be a formative step in her choice to switch disciplines. During this time of transition, Peters was met with outside forces that also caused her to question her career path. She was living in Tuscaloosa’s Forest Lake neighborhood when it was hit by the April 27, 2011, tornado. The process of picking up her life after the storm left her unsure about the next step. “I didn’t really know what was going to happen, everything was uncertain,” she said. But events soon fell into place. Peters learned that she had been accepted into New College and that she had received the EPA fellowship for which she had applied months earlier. Her chosen depth study, a requirement for all New College students, was environmental justice and civic engagement, which aligned perfectly with her new opportunity at the EPA. The fellowship paid for two years of tuition at UA and provided a summer internship at the EPA’s Atlanta office between her junior and senior years. In Graniteville, South Carolina, the site of a 2005 train wreck that spilled 60 tons of chlorine into the area, she worked with a documentary crew that interviewed community members. She also worked with community members who were employing an EPA-developed community action model to deal with the aftermath and cleanup of the spill. On another project she worked with ECO Action, an Atlanta-based community action group that addresses local concerns such as illegal tire dumping and air quality issues. She also worked closely with other South Atlanta community members to deal with issues of public health and the environment. Peters found she most enjoyed working with community members. Many times, she said, low-income or minority groups are left out of the decision-making process. When people come into their communities with solutions for local issues, the residents are often distrustful. Peters hopes to abolish this distrust in order to work with community members to generate solutions from within. In addition to her interest in public health, Peters’s experiences outside the classroom have stimulated her interest in other community-based issues, such as combating “food deserts,” places where healthy, affordable food is not readily available, such as in rural areas or urban neighborhoods. Peters has volunteered with the Druid City Garden Project in Tuscaloosa, which operates a school garden on the campus of University Place Elementary School and works to educate the community about the value of healthy food. Peters explained that working with school gardens is an effective way to get kids to start thinking about food in a healthier way. Through this work, she found that there is a generation gap in knowledge about how to cook healthy food, and she wants to help people reconnect to agriculture. Peters also gained insights into healthy food ways when she traveled to Bolivia, where the food culture is tied to their deity Pachamama, or Mother Earth. The country passed legislation in 2011 known as the “Law of the Rights of Mother Earth,” which grants rights to nature and ecosystems that are equal to those of humans. The law was passed to stop pollution and control environmentally unfriendly industries. Influenced by indigenous beliefs, the law is setting a global precedent for environmental legislation. 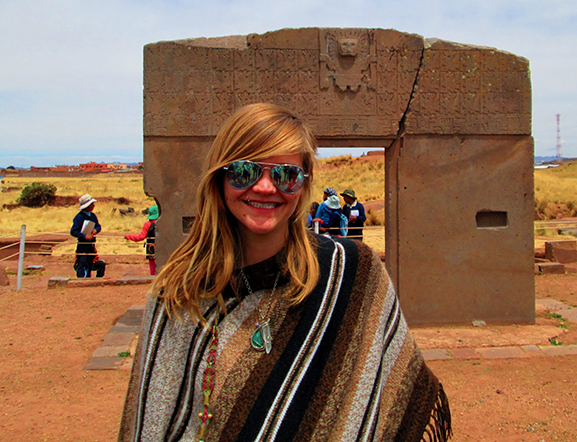 Because of her experiences in Bolivia, Peters is considering returning to South America, where she hopes to work more closely on issues that have become important to her. But first, she is working with the Health Action Partnership of Walker County to expand her community-based research skills. Regardless of where this path takes her, Peters says she intends to be engaged with communities and the environment, even if it means continuing to march to the beat of her own drum.